December 30, 2015 ~ Trevis Dampier Sr. So my In-laws are visiting and we are celebrating my Mother n Laws birthday so I wanted to take them somewhere elegant and festive for a great birthday dinner. What better place for a warming family atmosphere than a Italian Restaurant. 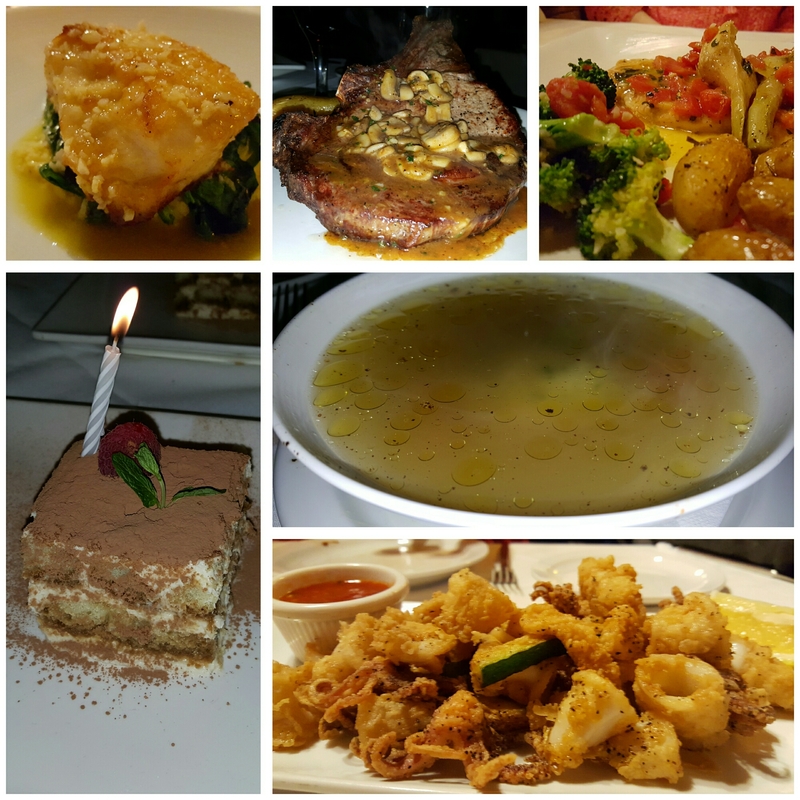 One of the best Italian Restaurants that I have been to thus far in the Bay Area is A Bellagio in Campbell,Ca. First of all, they have a great setting for evening dining. A fire blazing outside, with luxurious curtains and bright candles throughout the place, with smiles on every face you see. The waiters/waitresses always go above and beyond to make you feel special and cared for; which leaves nothing left to make this place perfect except excellent food. And excellent food they do have!! So we get seated and order some wine and then we are ready to order. First up is Ravioli in Brodo, which is veal ravioli in beef broth. Let me say that while this soup may seem to be simple, but it is something that will drive you bonkers on how good the flavor is as it blasts your palate. The broth alone is fantastic; and once you add the perfectly seasoned, succulent flavor of the veal ravioli then that marriage between those two is heavenly. Second up to bat is the Fritto Misto all’Italiana, which is Calamari, Prawns & Zucchini fried and served with spicy marinara sauce. The freshness of the ingredients made me feel like they just caught the squid and prawns within the hour. Everything was breaded and fried perfectly with awesome flavor and a marinara sauce so good you want to drink it with a straw! This Rib Eye Steak caught my eye at first glance..Plump mushrooms, gazing at me while they waddle in a glistening river bank of steak sweat on top of a lustrous mountain of monstrous rib eye goodness. Oh she is so precious..oh she is soo fine..
Oh my goodness!! The flavor is ridiculous! So tender that it melts in my mouth! This piece of cattle must have been massaged..Blessed and fed by hand to taste this good. Cooked at Medium Rare perfectly.. The Steak Sweat was perfect.. The mushrooms were fresh and seared with perfection.. Cheers to the Chef!! Cheers to A Bellagio!! True live action eating!! If you are in the Bay Area and looking for a romantic, great ambiance and great tasting restaurant then make sure you stop at A Bellagio. I promise you that you won’t regret it! < Previous Chinese Cuisine that will make Your Day when you Dine at Chin’s Gourmet!